Have you ever stopped to admire a tree? I can�t imagine who hasn�t. They are mystical with energy and warmth that feeds our existence. The meaning of the term �Tree of Life� alludes to the interconnection of all life on our planet and serves as a metaphor for common descent in the evolutionary sense. Moo~ve Over! No Cow Needed. We�ve seen the advertising ads �Got Milk?� and many of us grew up being told to drink our milk so we could grow up big and strong. Some people absolutley love this white creamy drink and others are intolerant of it whether due to the lactose, or like me, the taste. And as we advance as thriving humans on this planet we learn that what once seemed to be working may no longer be ultimate health, and/or we find a better substitute. Waking up each day, we should feel refreshed and excited for a full day ahead. Ending the day feeling balanced leads to a good night's rest. Our lifestyle choices determine our outcome day to day and over the long haul. Explore the many possibilities to add balance in your life while giving a vibrant YOU to others. We are all energy and when we are living a healthy balanced and active life together, we create balance and happiness. This energy flows to those you encounter too! Your energy affects others. 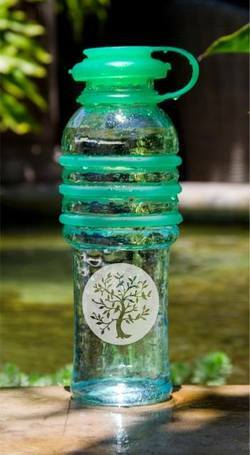 Celebrate Earth day all year with a Tree of Life BottlesUp. BottlesUp brings you North American recycled lead free glass with food grade silicone caps and rings. These bottles rock in sustainability, energy, and health! Get your Tree of Life BottlesUp! I respect your time. They are worth reading.